Many of us are aware of the growing number of people who find the lactose in milk and milk products indigestible. However, few resources exist for those who cannot tolerate the fructose in fruit or fruit products. An estimated 37% of those of European ancestry have Fructose Malabsorption Disorder, and numbers are unknown in other populations*. What exactly is Fructose Malabsorption and what are the symptoms? Is there a cure? Fructose Malabsorption used to be known as Dietary Fructose Intolerance, this term has been abandoned for two reasons. Firstly, to avoid confusion with Hereditary Fructose Intolerance which is a genetic condition that can result in liver damage; secondly, an “intolerance” is a condition in which absorption takes place successfully, but the body cannot process the substance. See also: Eat these 10 Super Foods to Live Longer. For example, those with Lactose Intolerance can absorb lactose, but once absorbed the body cannot metabolise it. Those with Fructose Malabsorption cannot absorb the fructose, and it is this lack of absorption that results in symptoms. As reported in Gerald Huether’s “Tryptophan, Serotonin and Melatonin”, when Fructose Malabsorbers consume fructose, it travels through the digestive system unabsorbed, eventually reaching the colon intact where it is broken down by the body’s intestinal flora into hydrogen and carbon dioxide. Fructose arriving in the lower intestine intact also interferes with the efficient absorption of the essential amino acid tryptophan. Tryptophan is known as an “essential” amino acid because the body requires it, but cannot synthesize it. Tryptophan must be obtained from dietary sources. Those with Fructose Malabsorption who ingest fructose have significantly lower levels of tryptophan in their blood than members of the general population. The initial symptoms of Fructose Malabsorption are gastrointestinal, and are remarkably similar to those of Lactose Intolerance. ingestion of foods containing fructose can cause bloating, flatulence, abdominal discomfort and diarrhea. The severity of symptoms varies widely from person to person. These symptoms are the result of the bacterial breakdown of the fructose in the colon into carbon dioxide and hydrogen and generally manifest within a few hours of ingestion of foods containing fructose, though some experience delayed reactions, making it difficult to connect consumption to symptoms. 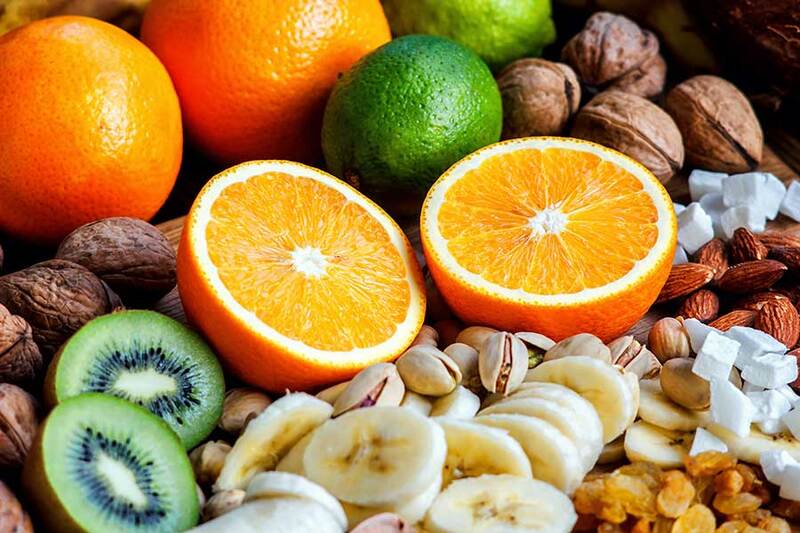 As the fructose interferes with the body’s ability to absorb tryptophan, the imbalance of neurotransmitters results in depression, irritability, and anxiety usually a day or two after ingestion. Again, these symptoms can be experienced in varying degrees and on varying timelines depending on individual tolerance and the quantities of fructose ingested. I Think I Might Have Fructose Malabsorption Disorder. What Should I Do Now? An easy, harmless first step in determining if you may have Fructose Malabsorption is an Elimination Foodplan. Simply, this involves eliminating from your diet anything that has any amount of fructose for a period of about six weeks. If you do have Fructose Malabsorption, you will start to notice a positive difference in the symptoms within the first week. As the weeks progress, you should feel better overall. After the six weeks have elapsed, try introducing a small amount of a fructose-containing food. If you have Fructose Malabsorption you will generally have a gastrointestinal reaction within a few hours. If you have no reaction, but the Elimination Foodplan did make you feel better, try another fructose-containing food. Many Fructose Malabsorbers can tolerate certain foods that others cannot. Everyone has their own tolerance threshold. If you have a reaction, and suspect you might have this condition, make an appointment with your doctor. Fructose Malabsorption can be diagnosed with a breath test. Usually a hydrogen breath test is used, but ensure you also receive a methane breath test. In approximately ten percent of all Fructose Malabsorbers, the bacteria in the colon produce methane rather than hydrogen. It is important to be formally diagnosed as Fructose Malabsorbers often have other digestive conditions such as Lactose Intolerance or Celiac Disease. You may have to be diligent, as Fructose Malabsorption is not as widely known or understood as Lactose Intolerance, even amongst healthcare professionals. Is Fructose Only Found in Fruit? Fructose is found in all fruits, to lesser and greater degrees. Apples and pears have the highest amounts and are universally intolerable to those with Fructose Malabsorption. Fructose, however, is not the only form of this sugar that Fructose Malabsorbers must avoid. Fructans, which are chains of fructose molecules ending in a glucose molecule are also unabsorbable. This widens the field of troublesome foods to include grains like wheat, spelt, kamut, and brown rice; as well as vegetables such as onions, leeks, asparagus and artichokes. As the source of the gastrointestinal symptoms is the bacterial breakdown of fructose in the colon, any food which adds to the bacterial population just makes things worse. This means Fructose Malabsorbers must avoid any foods which have active bacterial cultures like yoghurt, or are probiotic or prebiotic like chickory (inulin). If I Have Fructose Malabsorption, Will I be Off Wheat and Fruit Forever? Are There Pills Available, Like Those for Lactose Intolerance? The idea of an Elimination Foodplan is to eliminate all foods that have even the smallest potential to cause problems. This allows your body to reach a state in which you know for certain it is not being affected by any fructose presence. Once this state has been established, you can reintroduce foods containing fructose (or fructans) one at a time in small doses. It is important that foods be introduced in small amounts so that any reaction is minimal. The food should be consumed only once, then strict attention must be paid to any changes in your body over the proceeding days. When reintroducing foods, it is a good idea to begin with foods that contain the least amount of fructose or fructans. This will minimize the possibility of a drastic reaction. Also keep in mind that commercially frozen foods often contain different amounts of fructose than their fresh counterparts, and cooking can alter the amounts of fructose as well. Fresh strawberries, commercially frozen strawberries, and cooked strawberries may affect you to differing degrees. Through systematic experimentation, you will eventually develop a list of “forbidden foods”, and “only in moderation foods” that will be unique to you. Currently there is no medicine, no pill and no therapy for Fructose Malabsorption other than fructose avoidance. However, most Fructose Malabsorbers can ingest small amounts of fructose with reduced symptoms provided they also consume an equal or greater amount of glucose at the same time. The reason for this is unknown, but it is only effective in small amounts. Because of this phenomenon, small amounts of sucrose (which is a one-to-one ratio of glucose to fructose) can be tolerated. It is, in essence, fructose with a glucose “dose” built in. Sucrose is in most homes in such forms as table sugar, brown sugar, maple syrup or molasses. Honey contains both pure glucose and pure fructose, as well as sucrose. A pinch of powdered glucose should be added as “insurance” as the ratio in honey may vary. Powdered glucose, often sold under the name of dextrose, causes no negative reaction in Fructose Malabsorbers and can be used for sweetening without concern. Fructose Malabsorbers, like many other groups, have found each other online. Forums, bulletins boards and web groups abound. These are great venues for support, recipes and tips from fellow sufferers, but beware. As this condition is still widely unknown and misunderstood, many forums unwittingly circulate misinformation and supposition. If you wish to connect with others, bookmark several communities and read their postings regularly. Compare their information with your own research and your doctor’s advice and choose your group accordingly. If you wish to meet others in person and there is no Fructose Malabsorption group in your area, consider joining a Celiac Disease group or a Lactose Intolerance group. This will give you the opportunity to connect with others who contend with navigating a restrictive diet. They will have helpful advice on adapting and changing your favourite recipes and provide emotional support for making the transition of lifestyle. Grocery stores and pharmacies are continually selling greater and greater varieties of stomach remedies. Likewise, the media abounds with startling statistics of depression and anxiety being found in the general population. How many cases of undiagnosed Fructose Malabsorption are there? With fruit and wheat being such widespread staples, and High Fructose Corn Syrup being added to so many processed foods, it is only a matter of time before Fructose Malabsorption Disorder comes to the forefront of public attention. Until then, those who contend with this problem must take the initiative: educating themselves, sharing information, and raising awareness among their neighbours and healthcare professionals.